CustomSuitNYC employs the world’s best Italian tailoring to elevate your style to the next level. If you can't come to us, we'll come to you. We are available to travel to you anywhere in the world. From Business Suits to Casual Suits to Formal Suits, we've designed our suits to be comfortable and wearable for individuals of all shapes and sizes. We specialize in Slim Fit, Standard Fit, and Big & Tall Fit. Designed in Italy, Hand Crafted in our Factory, we've designed comfortable high quality suits starting at $995.. All suits come with a lifetime unconditional guarantee, no questions asked. We have extensive experience in making hand made wedding and black-tie event tuxedos. We can make your stand out from the crowd with a dapper tuxedo made by some of the best haberdashers in the whole wide world. Hand made tuxedos usually take 2 to 3 weeks to make, but rush options are sometimes available. Starting at just $1295, we can make you the highlight of your next event. For those who don't have to wear a suit everyday, but would like to portray an aura of confidence and professionalism at the office. Blazers are the ideal blend between professional attire and casual flair. We can make almost any blazer under the sun. From checks to plaids to textures to cross-weaves, our blazer selection will blow your mind. Starting at just $795, all our blazers are guaranteed for life. Our Italian designs are comparable to some of the best Italian designers in the world including Georgio Armani, Gianni Versace, Valentino Garavani, Karl Lagerfeld, Dolce & Gabbana. Our quality surpasses any suit made by Hugo Boss, Hickey Freeman, Brooks Brothers, J Press, Corneliani, Canali. We back that claim up with a 100% Unconditional Lifetime Replacement Guarantee. a custom shirt TO GIVE you the signature look. 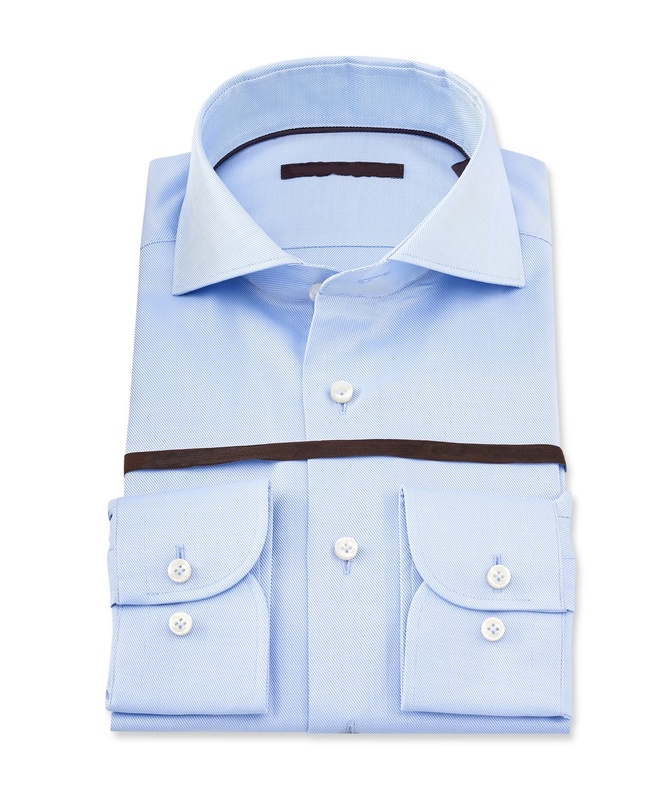 Custom shirts can afford you countless options for personalizing, from buttons to collar style to color selection. Instead of searching through dozens of stores just to find the right color to match your suit jacket, you can choose not only the color, but also the appropriate fit and style, and other detailing such as sleeve cuffs and breast pockets. You can even specify the finer points of the shirt's construction; for instance, you decide whether you would like a fused collar (one that is put together using a heated adhesive) or one that is hand sewn. This gives you control over the stiffness and lay of the collar. Ordering a custom shirt means you'll have endless options to express your personal style while ensuring the excellent fit and lasting quality. Men's blazers, jackets and sport coats are a wardrobe essential. Gentlemen wear them to work, for business casual days at work, out on the city, or casually with jeans. Just put one on over nearly any slacks or jeans to look dressed and refreshed. A custom made blazer will give you a clear-cut, relaxed look that pairs the flattering contour of a suit jacket with a casual feel. Pants can sometimes be overlooked by designers. At CustomSuitNYC, we invest as much attention to detail into our trousers as the jacket itself. Individual taste matters for custom made pants and choosing the details provides lasting results. The variants, fabrics and fits accessible are vast, but once you have chosen a style that's swanky and modishly in, your shopping experience becomes incredibly simple and fun for you. A custom made overcoat provides a finishing touch to your cold-season wardrobe. Overcoats tend to be worn on a daily basis during the season, and protect you and your wardrobe from the elements. It is the reason why many people consider an overcoat as an investment. Our overcoats, topcoats, and outerwear are expertly hand crafted with the same attention to detail as our suits. For when you have to look your formal best. For the most important day of your life, a custom made tuxedo will help you look your very best. Our custom tailor will help you plan your wedding day outfit. We even have groomsmen volume discounts if you would like to have custom made suits made for your grooms party. Our tailors specialize in making tuxedo's for formal affairs. We will help you look your very best for your office and formal functions.